Summer is all set to bid adieu and so are the stone fruits. Mangoes are slowly and subtly leaving the market and Peaches and Plums are showing the last of them this season. 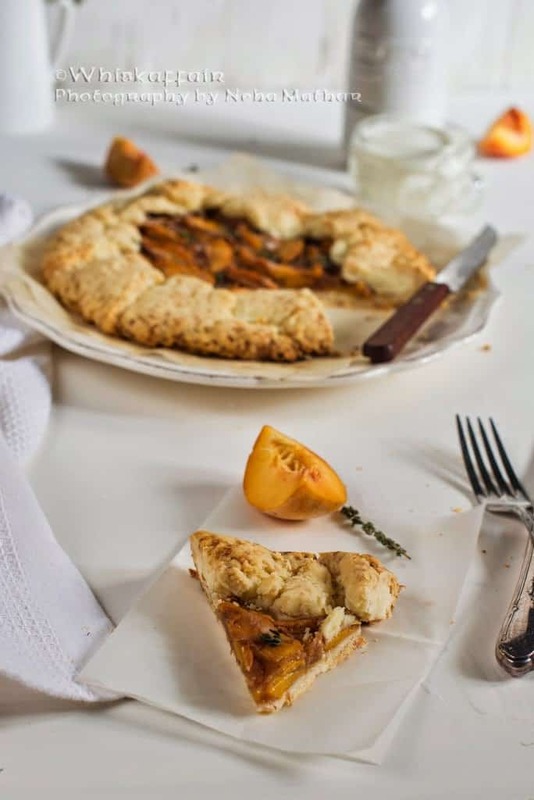 Before the stone fruits disappear from the market in another couple of days, I prepared Spiced Peach Rum Galette along with Upside Down Plum Cake. 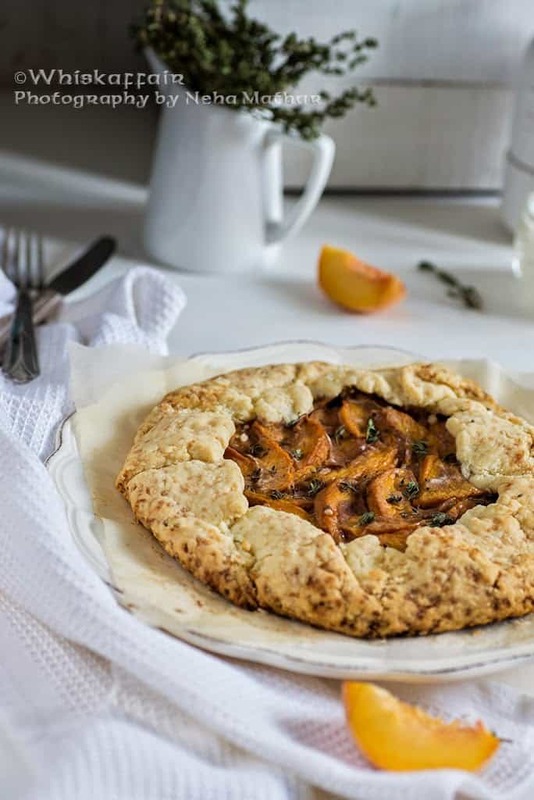 The Galette crust is my to go recipe and I have tried it a number of times without fail. 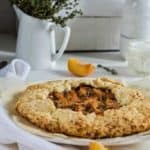 The peaches in Spiced Peach Rum Galette are spiked with a dash of rum and ground spices and are a perfect filling to go with the slightly sweet and flaky crust. If you want to skip Rum, just reduce the amount of cornflour to 1 tsp. 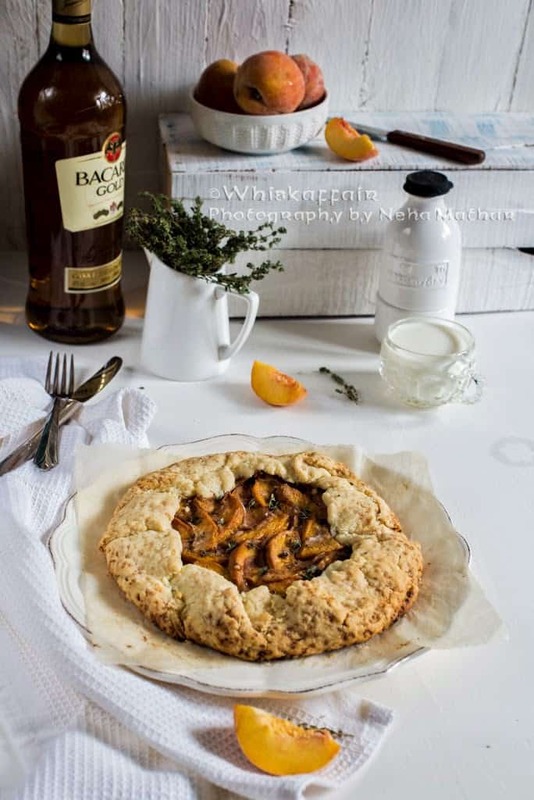 Spiced Peach Rum Galette tastes delicious with your favourite beverage or just as it is. Serve its fresh slice and see how the faces of your loved ones beam up with happiness. 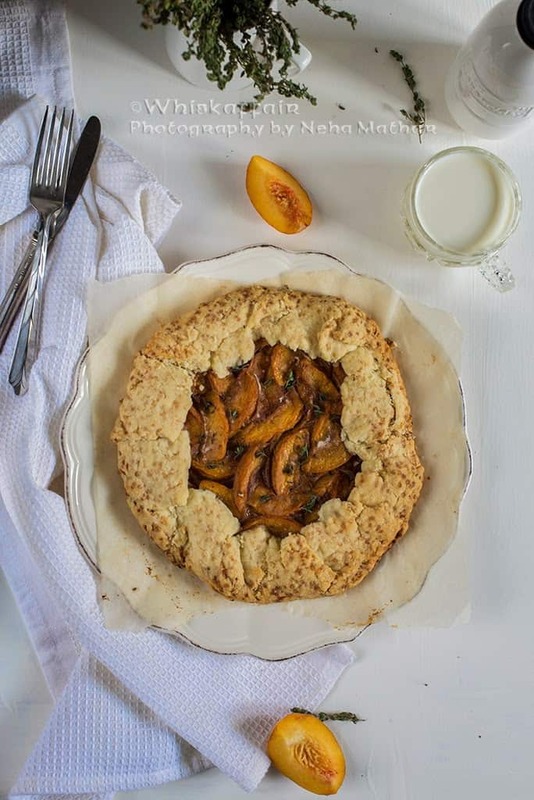 Go ahead and quickly scribble down the recipe to make this simple Spiced Peach Rum Galette at home. Also, to keep on learning more cakes and bakes every day, do follow me on Facebook, Twitter, and Instagram and interact with an ever growing Whisk Affair Community! Put the plastic blade in your food processor. Add all purpose flour, sugar and butter to it. Pulse together till butter is blended into the flour and the mixture is crumbly with some of the butter pieces the size of peas. Add water one tablespoon at a time and pulse just until the flour comes together. Remove the flour on the work surface and bring it together and make a ball. Flatten each half a little bit. Cover each half with a cling wrap and refrigerate for 30 minutes. Mix all the ingredients of filling in a bowl. Lay parchment paper on your counter top. Leaving 2 inch space , spread half of the peach filling on the pastry. Fold the sides of the pastry inside with your finger tips. It need not to be very smooth. Make both the galettes in the same manner. Transfer the parchment paper on the baking tray. Bake for 40-50 minutes, till the pastry is slightly brown. Serve hot as such or with a scoop of vanilla ice cream. 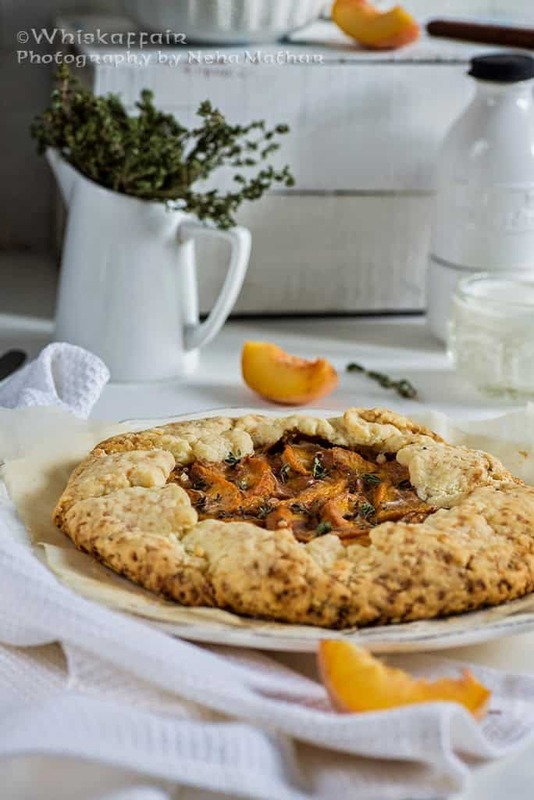 Very gorgeous galette, this is something extremely irresistible..